The tabouli recipe is a wonderful surprise with flavours that combine well. Also known as tabbouleh, this recipe has its origin in North Africa. Often bulgur is used instead of couscous. Since long this summer salad has become a popular in many other parts of the world. The incorporation of summer in the form of a salad. The mint and lemon pronounce this particularly. The summer salad is easy to prepare every kid could do it and it is a fabulous addition to any BBQ. Mix the couscous, olive oil, the diced onion, squashed garlic, hot water, lemon zest and juice in one bowl and let the mix soak for an hour or longer. Finely chop the parsley and the mint. Add both herbs to the mix. Cut the two seedless cucumbers into cubes and add. The 12 tomatoes are cut into 8ths and tossed under. 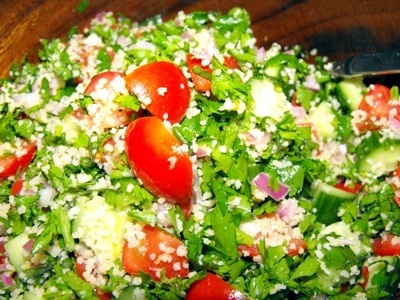 Taste the tabouli salad and season with salt and pepper. The salad has a fresh taste with a minty undertone especially suitable for the summer season. Despite the cucumber and tomatoes which usually don't like to be kept and refrigerated this tabouli salad tasted even better the following day. Please leave your thoughts about the tabouli recipe.